Would you stay in a pod less than half the size of a normal Premier Inn room? For prices as low as £19, the Whitbread chain is betting the answer is yes. The first Zip by Premier Inn hotel opens in the Roath area of Cardiff early next year and will have 138 rooms sized 8.5 sq m including a bathroom. 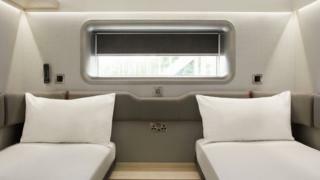 PriestmanGoode, which designs first class plane cabins, designed the rooms. Whitbread said the smaller room format would allow it to use a wider range of buildings in towns and cities across the UK. Alison Brittain, Whitbread chief executive, said Zip would let the company access a wider range of customers, including those who are "on a particularly tight budget but still expect and deserve the basics done brilliantly". Greg Johnson, an analyst at Shore Capital, said Zip should allow Whitbread to open hotels in locations that could not sustain a regular Premier Inn. He added that the main chain already has 800 hotels with about 80,000 rooms and would soon account for one in every eight hotel stays in the UK, suggesting that segment of the market was close to saturation. In April, Whitbread said it would spin off its Costa coffee chain in the wake of pressure from activist investors, before revealing a shock £3.9bn sale of the chain to Coca-Cola at the end of August. The FTSE 100 firm has tested its new hotel format with six Zip rooms on sale for several months at an unspecified Premier Inn hotel. There are more than 800 Premier Inns in the UK, along with 10 Hub by Premier Inn hotels in central locations in London and Edinburgh. Whitbread is still planning to open more Premier Inn hotels as well as new Hub and Zip locations.